In the first of a two-part feature, Matthew Goer of Associated Architects looks at the buildings which have helped shape Birmingham’s recent history, with one from each decade. As a growing industrial town, Birmingham recognised the importance of art education for the ‘designers’ working in the workshops of the city, to improve the quality of the products being manufactured. Allied to this was the growth of the Civic Gospel movement – a philosophy of municipal activism and philanthropy by the city’s nonconformist elite which strove to raise the standards of living for the expanding population, later championed by Mayor Joseph Chamberlain. Architect John Henry Chamberlain was responsible for many of Birmingham’s great Victorian civic buildings and the Grade I listed Birmingham School of Art on Margaret Street is his masterpiece. The building, with its vibrant Venetian Gothic expression, was a strong contrast to the ponderously classical Council House, and reveals a Birmingham inventing itself as a confident modern city. The site was donated by the Colmore Estate and the funds for building donated by the Tangye family. In the 1990s, the building was bequeathed to Birmingham City University (then Birmingham Polytechnic) where it now forms a part of the Birmingham Institute of Art and Design and has been in continuous use since its opening in 1885. With the rapid expansion of business and industry in the eponymous City Of A Thousand Trades, the city centre became an increasingly unhealthy place to live, despite programmes of civic slum clearance such as the construction of Corporation Street. The Cadbury name had been synonymous with the commerce of Birmingham for some time before George Cadbury and his brother Richard, decided to relocate his chocolate factory from Bridge Street in the heart of the city to the more rural Bournbrook in 1887. Like many philanthropists of the time, George Cadbury wanted a spacious location from which he would be able to expand the business and improve living conditions for his workers. Bournville’s greenfield site, with existing connections to both the railway and canals for milk and cocoa deliveries, was perfect. In 1893, Cadbury bought a further 120 acres of land around the factory and, at his own expense, began development of the model village, which by the turn of the century, included more than 300 cottages and houses. 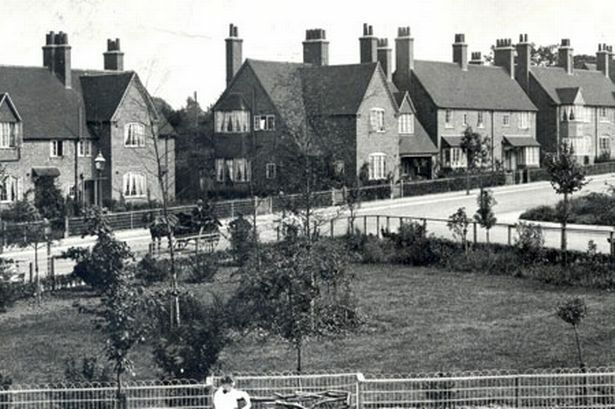 This was the starting point for the Bournville Village Trust to develop the Bournville that we know today and which still doesn’t feature a single public house, due to the Cadbury’s Quaker beliefs. As Birmingham prospered, so the Victorian suburbs continued to grow outwards lining the arterial routes into the city. As part of this expansion, additional churches to meet the needs of newly assembled congregations were required. One of the finest churches in England, the Grade I-listed St Agatha’s Church was designed by architect WE Bidlake and occupies a prominent location on the A34 Stratford Road. The construction of the church was funded through the sale of Christ Church at the top of New Street where the fountains in Victoria Square are now located. As the city centre flourished as a commercial centre and the suburbs grew, Christ Church became a victim of this success as its congregation dwindled. The new church’s most notable feature is its impressive tower - a fusion of Gothic and arts and crafts styles, which extends up to 36 metres from the ground and can be seen from miles around. The church has had a tumultuous history, with its sanctuary end almost completely destroyed by a German bomb in 1940 and the roof having been consumed by a fire in 1957. In line with the growing civic aspirations of a modern Victorian city, the founding of a university was inevitable. Originally located on Edmund Street in the city centre, the University was established in 1875 as the Mason Science College by Sir Josiah Mason, the industrialist and philanthropist. Following the granting of its royal charter in 1900, the college was transposed to a 25-acre site on the fringe of Edgbaston, a gift from land owner Lord Calthorpe. Designed by architects Aston Webb and Ingress Bell, the new university campus buildings were arranged around ‘Old Joe’, the university clock tower, affectionately and informally named after Joseph Chamberlain, who was the University’s first chancellor. The clock tower is a major landmark, having been influenced by the campanile of the Town Hall in Siena, Italy. From its completion in 1908 until 1969, the tower – at 110 metres tall – was Birmingham’s tallest building and is still the third tallest in the city and one of the top 50 in the UK. It also holds the record for the tallest freestanding clock tower in the world. The rapid expansion of the University after the Second World War meant that Aston Webb’s original masterplan for the campus was never fully realised, but is now being used as a reference for the current University masterplan, in which a ‘green heart’ to the campus is being created. Dedicated to more than 12,000 Birmingham citizens who died in the First World War, the Grade II-listed Hall of Memory, designed by architects SN Cooke and WN Twist, was the first part of a masterplan for a new civic quarter to break away from the formal, centralised layout of Victorian cities. The full masterplan was to include the municipal bank, located on the other side of Broad Street, as well as new council offices Baskerville House, a residency for the Mayor of Birmingham, a concert hall and public library. The plans for the full development were abandoned following the onset of the Second World War, which also left Baskerville House only half-completed. The Hall of Memory was the first building in the city to be constructed of Portland Stone, while the interior was finished by the renowned Birmingham Guild, utilising the metalwork skills and quality for which Birmingham was internationally renowned. A companion colonnade to the Hall of Memory was dismantled to allow the formation of Centenary Square in the 1980s and rebuilt in the St. Thomas’ Peace Garden on Bath Row. The effects of the Great Depression were short-lived in the Midlands and a prosperous period followed in which the living standards and social mobility of the working population improved. The 1920s had seen the rise of the cinema as a form of mass popular entertainment and in Birmingham, like many other cities, it performed a broader social function that went beyond the mere screening of films. The best-known of the UK cinema groups, Odeon, started out in Birmingham as the brainchild of Balsall Heath-born Oscar Deutsch, who built his first Odeon cinema in Perry Barr and went on to build many more throughout the UK. Designed by architect Harry Weedon, the Perry Barr Odeon was a striking example of the changing architectural styles of the time. The Art Deco style in which it was built represented luxury and glamour, while the bold industrial motifs symbolised success in industry. Deutsch was so enamoured by the design of the building that he commissioned Weedon to design many of his subsequent cinemas; a move that is widely credited as having played an important role in popularising modern architecture in Britain. The best remaining examples in Birmingham are in Kingstanding and Sutton Coldfield, which remains a cinema to this day. Housing (Temporary Accommodation Act 1944) prefabricated bungalows were erected across Britain, manufactured from steel, concrete, and asbestos sheets. The ‘Prefabs’ were notable for their efficient use of space and fully fitted interiors, which included novelties such as fitted kitchens with washing machines and refrigerators. Envisaged as a stop-gap measure, the prefabs were designed to stand for around 15 years, providing short-term residences for those displaced by the bombing. However, over time, people changed and customised these one-size-fits-all units, making them their own. Far from being disposable, these prefabricated houses became much loved by their owners. From 1944 to 1948, around 156,000 of these homes were built, of which just 16 houses, built in 1945, still survive in Birmingham, in Wake Green Road, Moseley. These are of the Phoenix design, which was one of the rarest and least publicised types of prefab. Only one alone has remained unmodified since its construction and their importance have recently been Grade II listed by English Heritage.